Published: June 13, 2016 at 12:27 p.m. Updated: June 14, 2016 at 10:30 a.m.
College Football 24/7's "16 for '16" series continues with a look at 16 games this fall that are loaded with NFL-caliber talent. Naturally, some of the most talented teams in the country are listed more than once, and quite a few rivalry games found their way to the list as well. With NFL Media analyst Chad Reuter's ranking of the top 100 players in college football serving as a guide for which teams have the best talent, here are games NFL scouts should have circled on their calendars. Mike McGlinchey is expected to replace first-round pick Ronnie Stanley at left tackle for Notre Dame, and do so with great effectiveness. Behind him, the rushing duo of Josh Adams and Tarean Folston, who is returning from a knee injury, could be dynamic. USC will have its usual playmakers at the skill positions, led by Adoree' Jackson on defense and star receiver JuJu Smith-Schuster on offense. Up front, USC's Zach Banner is one of the nation's biggest (6-foot-9, 360 pounds) and best offensive tackles. After losing 12 players to the NFL draft, the Buckeyes still have some impressive pieces around which to rebuild. Among those pieces is Raekwon McMillan, an inside linebacker with the speed to get to the sideline. The offense will be in the capable, veteran hands of QB J.T. Barrett, and heavily recruited options to reload the running back and receiver spots. Oklahoma brings back most of its key pieces on offense, with QB Baker Mayfield primed for a potential run at the Heisman Trophy. Look for WR Dede Westbrook to rise from a solid No. 2 receiver to a star No. 1, and don't sleep on OL Orlando Brown Jr. The Cardinals' defense is looking loaded again. Maybe not quite like it was two years ago, when seven defensive starters were drafted, but close enough. DE Devonte Fields and a stout secondary will face a loaded Clemson offense (QB Deshaun Watson, RB Wayne Gallman and TE Jordan Leggette), which will also welcome back star WR Mike Williams from injury. Ole Miss lost a trio of first-round picks, but returns several all-conference threats in QB Chad Kelly, S Tony Conner, DE Marquis Haynes and TE Evan Engram. Kelly is the SEC's top returning quarterback. Versatile FSU DB Derwin James might be just the guy to match up with Engram in pass coverage. One of the most intense rivalries in college football usually brings together enough talent to keep scouts' heads on a swivel. Florida's secondary, despite losing two first-round picks, returns a gifted duo in CB Jalen Tabor and S Marcus Maye. FSU's receiving corps would challenge that with proven WRs Kermit Whitfield and Travis Rudolph. Another matchup worth watching: FSU OL Roderick Johnson -- the ACC's Jacobs Trophy winner last year as the league's top blocker -- vs. Gators DE/LB Bryan Cox. Four players involved in this game rank in CFB 24/7's top 20, two on each team, led by Tabor. Look for this one to be closer than last year's OSU-dominated installment of this storied rivalry (final score: 42-13). Michigan's Jabrill Peppers will be a nice test for Ohio State's new options at running back, including the versatile Curtis Samuel. Another player to watch for on OSU: OL Pat Elflein, who considered early draft entry. Of the eight players in this game that are ranked in the CFB 24/7 top 100, six fall in the top 50. Texas A&M star DE Myles Garrett, a junior, makes his season debut against one of the top tackles in college football (Conor McDermott), and Garrett will be pursuing one of the game's best quarterbacks (Josh Rosen). As individual matchups go, that's popcorn-worthy theater. NFL Media analyst Daniel Jeremiah has already taken a close scouting look at Garrett. Others to watch for: UCLA DL Eddie Vanderdoes, UCLA DB Fabian Moreau, TAMU S Armani Watts and TAMU WR Josh Reynolds. No two schools in the ACC are attracting talent quite like the Seminoles and Tigers, so when the two Atlantic Division foes meet each year, it's the league's heavyweight event. FSU RB Dalvin Cook returns for what should be a third consecutive 1,000-yard season, and he has plenty of help around him. Many of Clemson's top returners play on the offense, including Heisman candidate QB Deshaun Watson and RB Wayne Gallman. Nine top-100 players play for these teams, and five of them are ranked in the top 20. This cross-divisional SEC clash will bring together stellar talent at defensive end, featuring TAMU's Myles Garrett and Tennessee's Derek Barnett. Volunteers star Joshua Dobbs is an accomplished dual threat at the quarterback position, ranking No. 8 on CFB 24/7's top 100 list. Texas A&M safety Armani Watts, the Aggies' leading tackler last season, will be charged with keeping Dobbs in check. 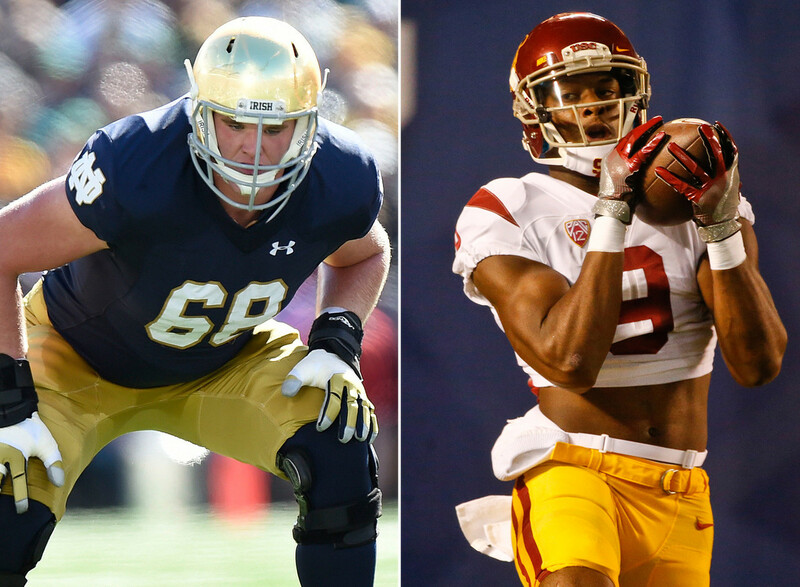 The teams combine for six of the top 50 players in CFB 24/7's top 100. Alabama will be looking to snap a two-game losing streak to the Rebels, and will have to do so on the road. Ole Miss returns quarterback Chad Kelly, who has plenty of arm strength, and talented tight end Evan Engram. Alabama will counter with a talented secondary that includes Reuter's No. 11 player in the nation (CB Marlon Humphrey) and 60th-ranked Eddie Jackson at safety. The Gators' Jarrad Davis, one of the SEC's hardest-hitting linebackers, would raise his profile with scouts if he were to deliver a strong performance against a physical Tigers offense line and star RB Leonard Fournette. Gators DL Caleb Brantley has the same opportunity. What could be the most exciting matchup of Week 1 might prove to be a defensive struggle. LB Reuben Foster, a senior, is the program's "next man up" following five Alabama inside linebackers who've been drafted since 2010. He'll be one of several strong draft possibilities on the defensive side for Alabama, while USC counters with All-Pac-12 CB Adoree' Jackson, an exciting young talent opposite Jackson at cornerback in Iman Marshall, and a budding star in LB Cameron Smith. Both programs, as well, will be breaking in new quarterbacks. After enduring the embarrassment of being shut out in the 2016 draft, Tennessee should be primed for a bounce back next spring. DE Derek Barnett, LB Jalen Reeves-Maybin and CB Cam Sutton give UT an all-conference talent at each level of the defense. On offense, RB Jalen Hurd is UT's most talented rusher since Arian Foster. Alabama TE O.J. Howard is one of the nation's most athletic pass catchers at the position, and electric WR Calvin Ridley returns for his sophomore year to give a new UA quarterback some quality weapons. The Aggies have lost to LSU four years in a row since joining the SEC, but get a home-field chance to turn that around this fall. The Aggies have arguably the nation's best defensive end tandem in Myles Garrett and Daeshon Hall. In Garrett and LSU star running back Leonard Fournette, the game features a pair of top-5 players in our top 100, as well as a big-play wide receiver in Travin Dural (No. 64 in the top 100). Next in the line of draft-worthy Texas A&M offensive tackles: Avery Genessy, who ranks as the No. 43 player in CFB. The Aggies also feature one of the nation's deepest receiving corps, led by sophomore Christian Kirk, who ranked No. 29 on the top 100 list. Alabama boasts four of the first 13 players ranked in the top 100, including No. 4-ranked Tim Williams, who's an explosive pass rusher. The gold standard for this series, in terms of future NFL talent, remains the 2011 game (48 eventual picks). But the presence of NFL prospects in both programs remains very high. LSU DB Jamal Adams leads an always-gifted Tigers secondary. Alabama DE Jonathan Allen, a senior, has flashed first-round potential and will lead another loaded Crimson Tide defensive front.